After starting with 68 teams, the field is down to only 16 teams, and this year's madness has been a bit crazier than most. UMBC takes the cake at the cover story of the year, but this year's Sweet 16, perhaps, isn't as crazy as we all thought. After all, Duke, Syracuse, Michigan, Kentucky, Gonzaga, Villanova, Purdue and Kansas aren't exactly small upstart programs on the dance floor for the first time. Loyola is probably the best story of the Sweet 16, but it's probably time to pull the plug on the fairytale. With Thursday and Friday set to cut the field down to eight teams, and the Elite 8 cut to the Final Four by the end of the weekend, AccuScore simulated the remaining bracket 10,000 times, and Villanova comes out on top. But before we get there, let's go region-by-region and work from the Sweet 16 to the Final Four. Along with the South, the West Region also plays on Thursday and Saturday to decide its corner of the bracket. Gonzaga is a HEAVY 70% favorite over Florida State on Thursday, while the AccuScore computer likes Michigan to put down Texas A&M. With the no. 3 Michigan Wolverines facing the no. 4 Gonzaga Bulldogs in the Elite 8, AccuScore likes another upset with the Bulldogs advancing to the Final Four. Not a member? Use code NCAAm and get 25% off an All Sports monthly or annual membership for a limited time (Note: Free trial available for first time members): Join AccuScore Today! Duke vs Syracuse is a classic matchup, but AccuScore doesn't think the Orange stand much of a chance against the Blue Devils. Of all the Sweet 16 matchups, this game appears to be the most lopsided according to the computer. Duke is a no. 2 seed and Syracuse is a no. 11 seed that barely made the tournament. Add in that the Blue Devils beat the Orange by 16 points this season, and this game could get ugly. On the other side of the Midwest region, Kansas takes on Clemson, with the no. 1 seeded Jayhawks expected to put down the no. 5 seeded Tigers with a 61% chance. In the Elite 8, Duke is projected to pull the upset in a close game and add another Final Four appearance for Coach K.
Like the Midwest Region, the East Region also has its no. 1 and no. 2 seeded teams alive. No. 1 Villanova is 70% to get past no. 5 West Virginia, while no. 2 Purdue is 61% to advance past no. 3 Texas Tech. As far as regions go, the East has been as clean as they come, so seeing no. 1 Villanova and no.2 Purdue face off in the Elite 8 shouldn't be a shock. 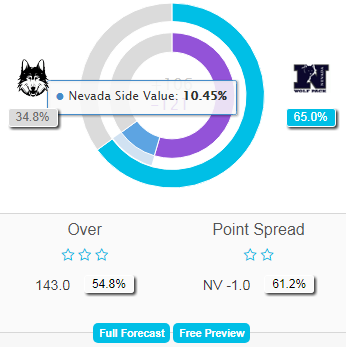 AccuScore projects a close game with Nova edging Purdue 54% to 46% to advance as the only no. 1 seed into the Final Four. According to AccuScore, Kentucky vs Gonzaga is a coin-flip game, with the Wildcats edging out the Bullsdogs by the slightest of margins, 51% to 49%. Meanwhile, Villanova is considered a favorite over Duke with a more notable 54%-46% edge, but that's hardly a heavy favorite. Upon reaching the final, Villanova actually enjoys more of an edge with a 60% to 40% edge over Kentucky. In terms of raw percentages, Villanova enters the Sweet 16 with a 16.1% chance to win it all, while Duke is close behind at 15.9%. Gonzaga is 11.9% to go all the way, while Kentucky is 9.2% to complete the magical run. On the opposite end of that spectrum, Syracuse is the longest shot to win it all with only a 0.2% chance. Kansas State isn't far behind at 0.3% chance to win it all, while Loyola of Chicago is 2.05% to do the unthinkable. Last Chance: Use code NCAAm and get 25% off an All Sports monthly or annual membership Join AccuScore Today!